Photo by United States Forces - Iraq (Inactive) - used under a creative commons license. For books that are not at Wellesley, use WorldCat and follow the above suggestions. The Woman in Battle: A Narrative of the Exploits, Adventures, and Travels of Madame Loreta Janeta Velazquez, Otherwise Known as Lieutenant Harry T. Buford, Confederate States Army. A digital book from the Documenting the American South collection at the University of North Carolina. Print copy published in 1876. Use the following databases to find articles on women and the military. Reports from the Government Accountability Office, from 1920-present. international in scope; indexes U.S. Congressional hearings; covers 1915-present. hearings and reports from Congressional Committees. Detailed reports from the U.S. Dept. of Defense. Use the advanced search and find women and military in the title, or search for women and Air Force, etc. You can limit the search to only those reports available in full text. includes links to oral histories, historic documents, and photographs. civilian non-profit veterans association comprised of women who have served or are serving honorably in the United States Marine Corps regular or reserve components. From the National Women's Law Center, 1992. 1993. RAND study that resulted from a request to assist the Secretary of Defense in drafting an Executive Order to end discrimination on the basis of sexual orientation in the U.S. Armed Forces. 2010. RAND Corporation conducted a study on sexual orientation and U.S. military policy in order to provide information and analysis that might be considered in discussing the possible repeal of the law known as "Don't Ask, Don't Tell" (DADT). Clapp Docs VB324.W65 T34 1992 2 vols. Also available online: Volume 1 and Volume 2. Links to various statistical reports. Located at the Ceremonial Entrance to Arlington National Cemetery, the memorial is the only major national memorial honoring all women who have defended America throughout history. The Web site Includes a history archive and online exhibits. A project of the American Folk Life Center, Library of Congress; includes women veterans' stories. 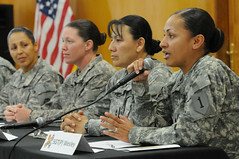 For women in the military, women contemplating military service, and women veterans. Documents the female experience in the U.S. Armed Forces through letters, papers, photographs, published materials, uniforms, artifacts, and oral histories. University Library, North Carolina Greensboro.